What’s more all-American country style than a farmhouse with a chicken coop and eggs for breakfast? And when the feathered friends are walking around in a garden of prairie flowers, their tracks make for the cutest pattern. 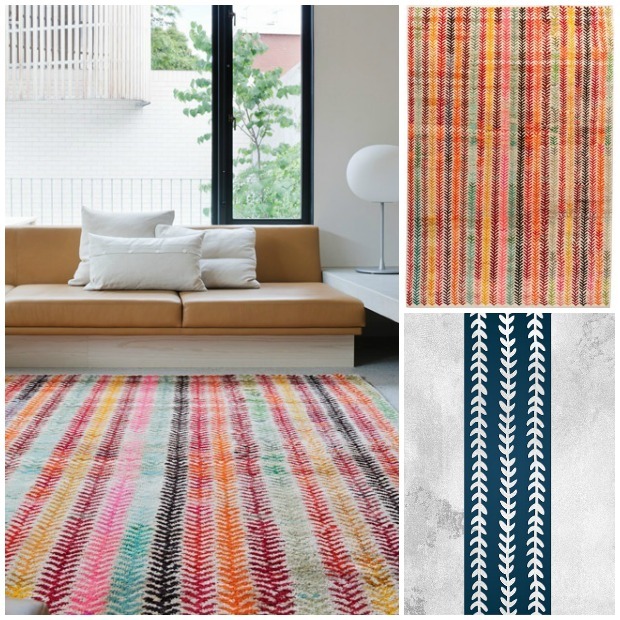 So when I saw this rug with a pattern similar to chicken tracks from the Australian rug company, Loom (they call it “Old Yarn Rug: Wheat“), it reminded me of the Chicken Stitch Border stencil by Royal Design Studio, and inspiration struck. 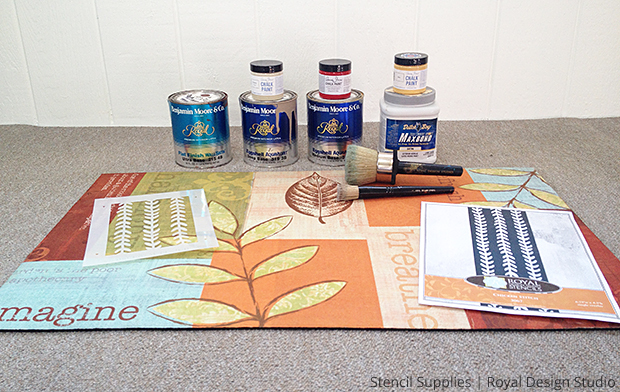 I decided to create my own DIY stenciled door mat! 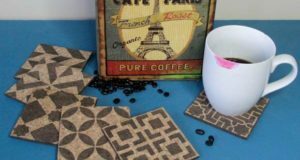 Look for a doormat or rug with a flat surface. 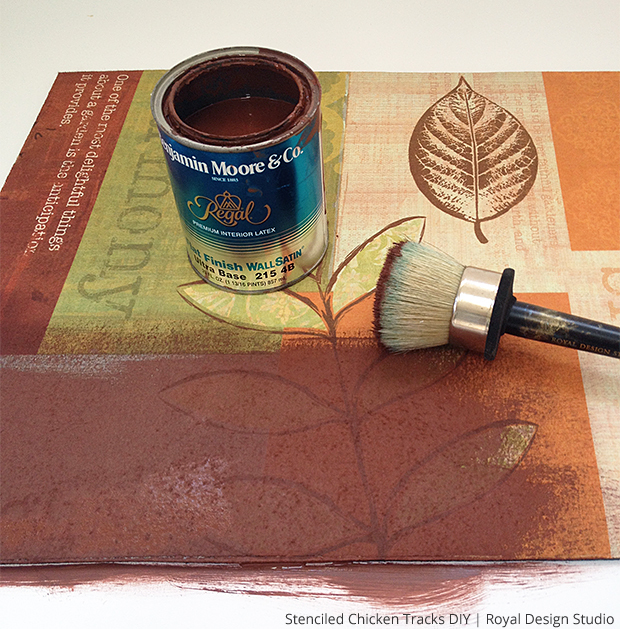 If you cannot find a doormat, you can paint on floorcloth (here is a tutorial for painting on floorlcoth). If you use floorcloth, you can make it stick to the floor for safety – Martha Stewart has a great tip that uses caulk to make rugs non-slip. I found a doormat with a flat surface for just $7 at Home Depot. 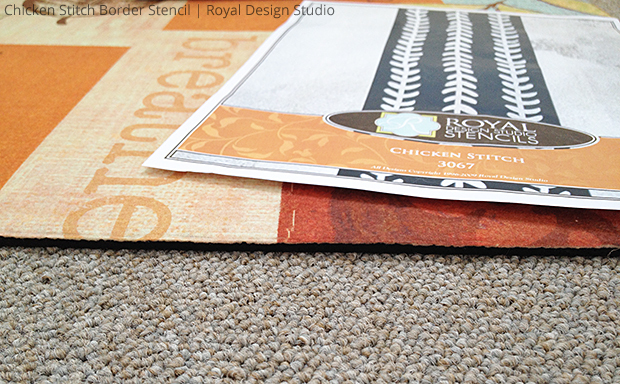 If the design of the rug is not your style, don’t worry as you’re going to paint on it. 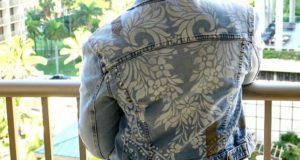 In fact, if it’s not your style, you won’t feel guilty about painting over it! 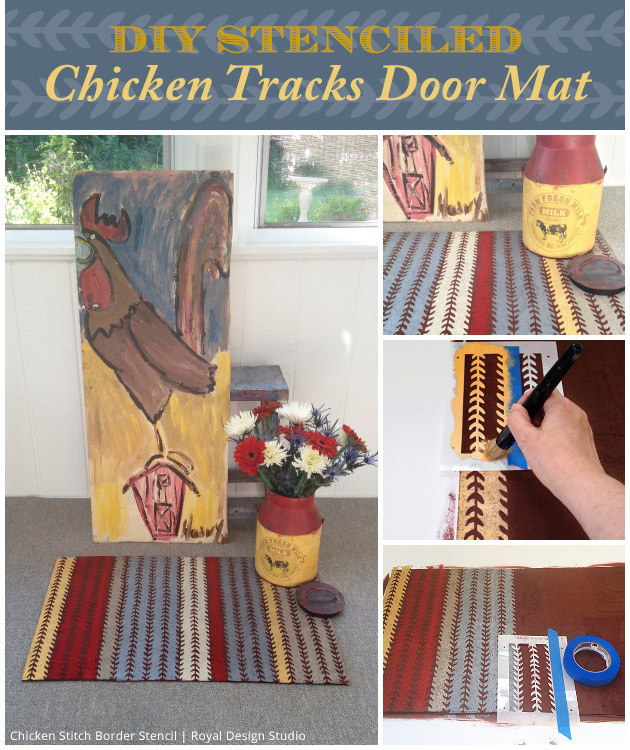 For the first step, paint the entire rug with the color you want your chicken tracks to be. 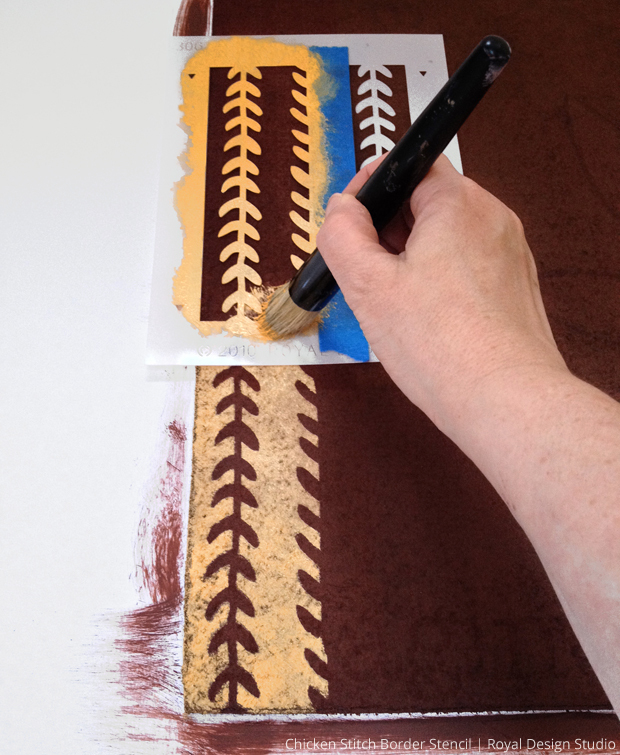 I chose to use a dark brown Benjamin Moore latex paint left over from a wall painting project years ago. You too may have partial cans of paint left over from projects around your home. If you use those paints, your rug will tie in with the colors already used around your home. Cool trick, huh! 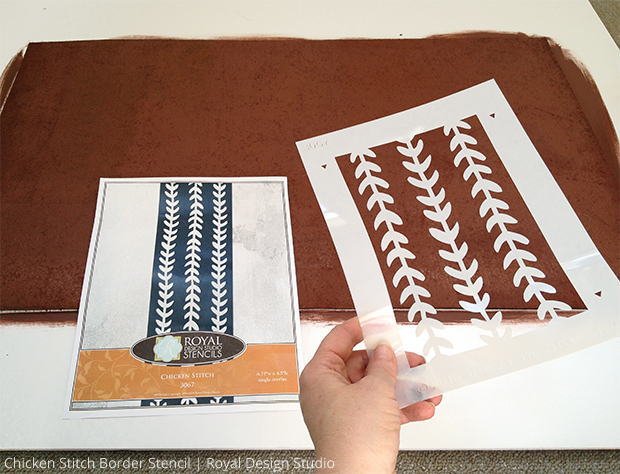 You can paint the stencil with one color, or choose a variety of paint colors to make stripes. 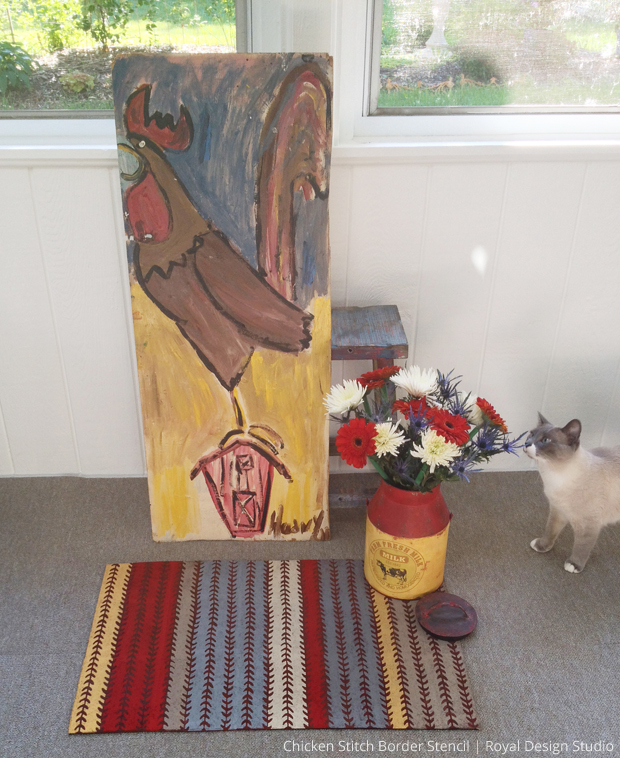 This doormat is for our sunroom and I was inspired by the colors in a folksy rooster “outsider art” painting that hangs in that room. I’m also painting the cabinets in the sunroom with red Emperor’s Silk Chalk Paint by Annie Sloan, so I also worked some of that red color into the rug. 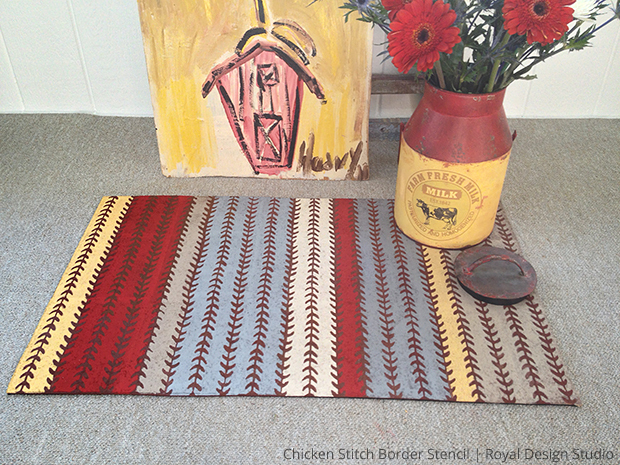 This shows how you can pull colors from a room into the stripes for your DIY doormat. Look for colors in your furniture, walls and artwork. Also, choose colors that will contrast enough with the color of your chicken track paint so the tracks will show up well. If you painted your first coat a light color, choose darker colors for the stripes, and vice versa. Once your first coat of paint dries (my doormat sucked up a ton of paint so it took a while to dry), start stenciling your first stripe with the Chicken Stitch Border stencil. 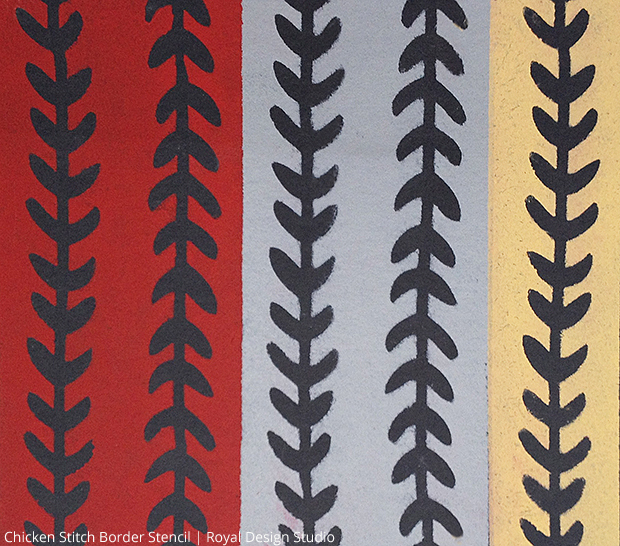 You can paint all your stripes the same width or vary the widths. 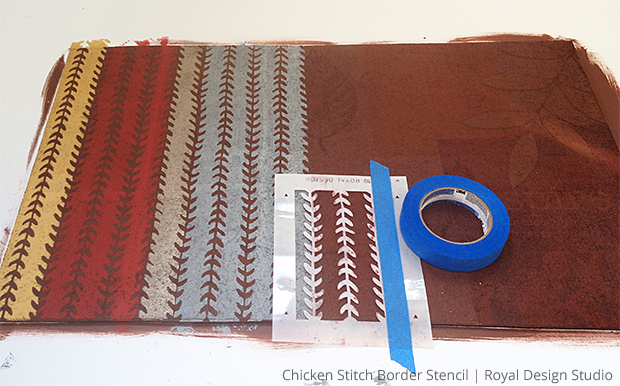 If you’re painting stripes with more than one color, it helps to tape off parts of the stencil. You could tape up the middle of a chicken track as I did to make “fringy stripes” or you could tape up the middle of the striped area to get a look as shown below. As you can see, I chose to place colors somewhat randomly and in differing widths for this project, just for the fun of doing something different. 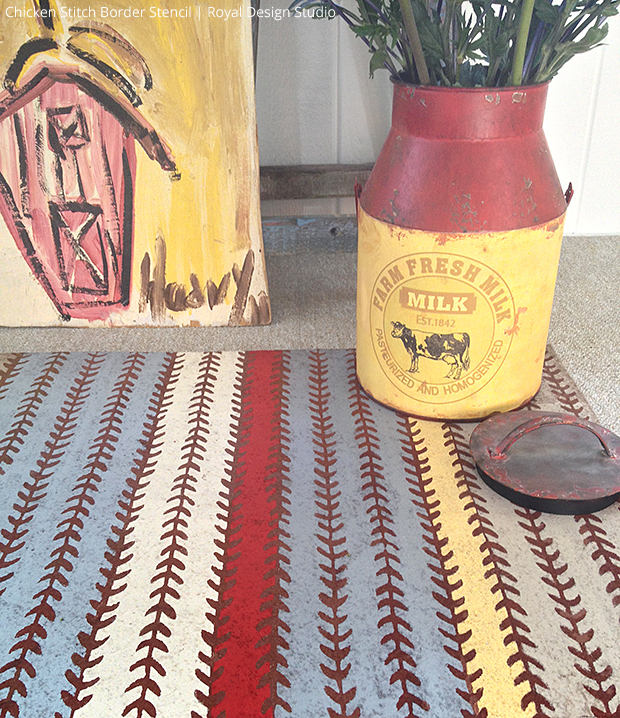 The finished doormat adds a cute country farmhouse touch to our sunroom doorway. You could paint this pattern on placemats or get a whimsical look to your garden flagstones by running a few tracks diagonally. If you have a chicken coop, why not decorate it with a little fun pattern? People put chandeliers in a chicken coop, so stenciling it is tame decoration by comparison! 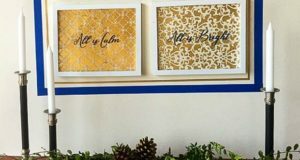 There might not be a “cluck cluck” social media sharing app, but you could #royaldesignstudio and “tweet tweet” this DIY if you like the idea. What a FUN idea! Love your project, Deb! Way cute Deb! 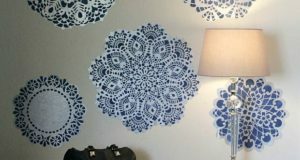 Loving this stencil!